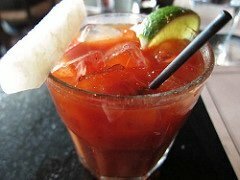 The Bloody Mary cocktail was invented in the 1920′s by an American bartender. At Harry’s New York Bar in Paris, a man named Fernand Petiot apparently came up with the concoction. This tomato based drink was originally only a cocktail of vodka and tomato juice in equal parts back in the 1930′s. Petiot wanted to remove some of the blandness and added black and cayenne pepper, and Worcestershire sauce, tobacco sauce and a little lemon juice. The beverage gained popularity, mainly because of it’s added complexity over only tomato juice and vodka. It was at the King Coole Bar in St. Regis that Fernand said one of the boys from the establishment said that they should call it a Bloody Mary because it reminded him of a bucket of blood he saw at a club in Chicago. It wasn’t just that nasty bucket, but also a woman there he remembered with the name Mary. Fill highball glass with ice about two-thirds of the way. The Bloody Maria the southern-style hermana of the Bloody Mary, the only difference being that in Maria you use tequila instead of vodka. I really like this recipe from The Bartender’s Black Book as the optional ingredients add a little kick, especially the clam juice and dijon mustard. Garnishes for both of these drinks can get a little crazy. 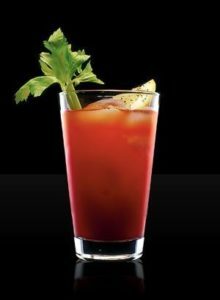 In Canada, our super-popular version of the above two cocktails is what we call the Bloody Caesar, or just the Caesar, for short. We rim our glasses with celery salt, garnish with a lime and instead of tomato juice we use Clamato.